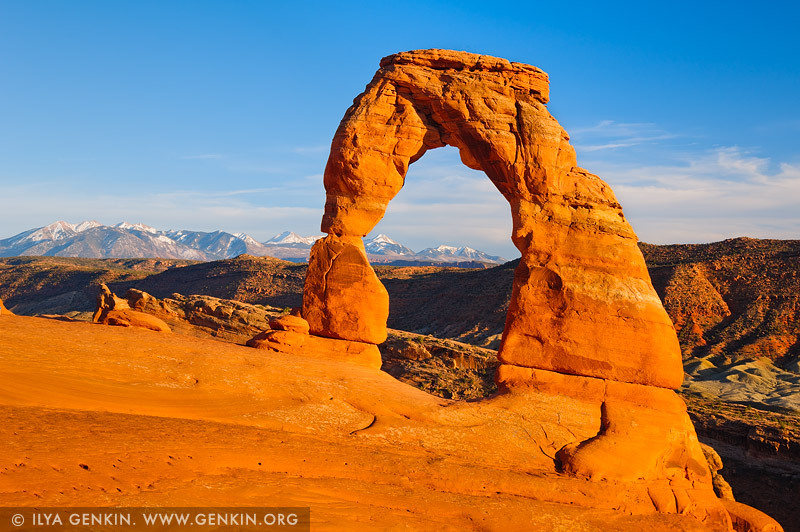 Delicate Arch has become the unofficial symbol of Utah. Towering eighty feet (the arch is a 52ft or 16m tall) over hikers, Delicate Arch is one of the highlights of Arches National Park and is possibly the most beautiful arch in the world. This arch needs to be experienced in person to be really appreciated. It is depicted on Utah license plates and on a postage stamp commemorating Utah's centennial anniversary of statehood in 1996. The Olympic torch relay for the 2002 Winter Olympics passed through the arch. This image belongs to the travel and nature stock photo library. This stock photo of Delicate Arch at Sunset is available for licensing for commercial and editorial uses including websites, blogs, books, magazines, brochures and advertising. Restrictions may apply for images which contain third party copyrighted material or sensitive subjects. Photos of artwork are for editorial use only. This image id US-UTAH-ARCHES-NATIONAL-PARK-0008 of Delicate Arch at Sunset, is copyrighted © by Ilya Genkin. This is not a public domain image.